In October 2016, as my vacation pictures on this Web page show, I re-visited the Cimitero Monumentale di Staglieno, in Genova. One doesn't fall in love with Staglieno; rather, one is overwhelmed by it on many levels, and one very quickly develops a deep respect for its uniqueness. It's something like visiting a national shrine where memories and history and the deepest emotions are both guarded and offered to the humble visitor. Staglieno has been called Europe's largest outdoor museum. Even while that is not its primary purpose, it is without doubt a world-class collection of original sculpture that expresses much of the culture of the XIXth century through realism, symbolism, romanticism and even a bit of modernism. 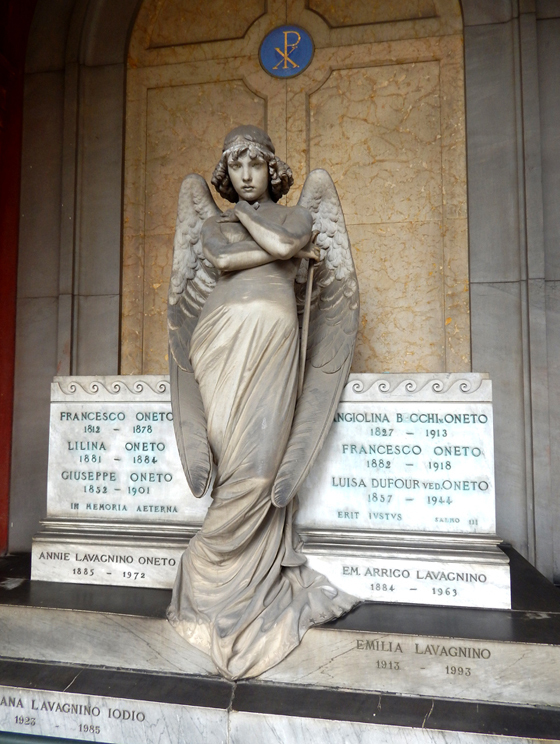 The "face" of Staglieno - its most often-seen monument - is the Monteverde Angel which stands over the tomb of the Oneto family. It was sculpted by Giulio Monteverde (1837-1917) in 1882. This was a photo I took on 6 October 2014. Another very popular image from Staglieno is the Monument to Caterina Campodonico, sculpted by Lorenzo Orengo (1838-1909) in 1881. The marble statue is remarkable for its detail, and even more so for its provenance. 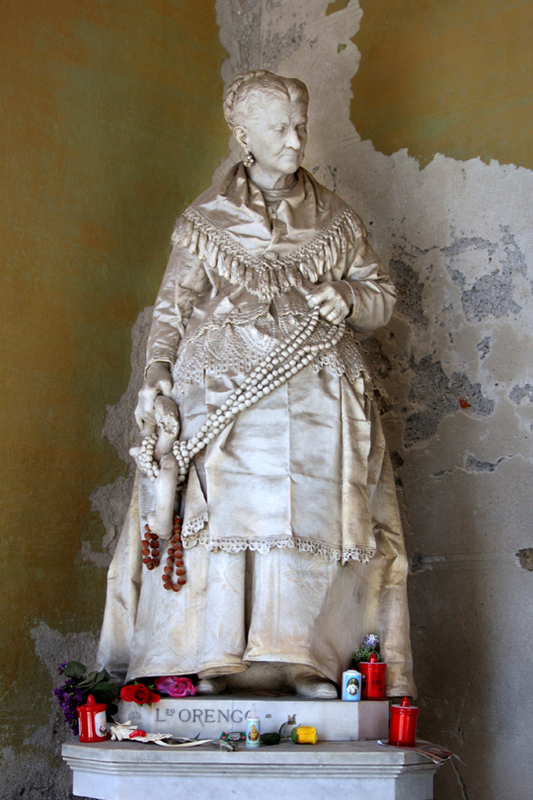 Caterina Campodonico was known in Genova as la Paesana, or la signora delle noccioline (the Peanut Lady) a woman who spent her entire life selling chestnuts, canestrelli, and trinkets on the streets and in the sanctuaries of Acquasanta, Garbo and San Cipriano in and around Genova. She, herself, engaged the sculptor Orengo to make her monument, and saved most of the agreed-upon fee to pay him. At the time of her death not quite enough had been saved, so the difference was made up by donations from the people of Genova. This photo is from Wikimedia Commons, credited to Faber1893, 14 June 2014. 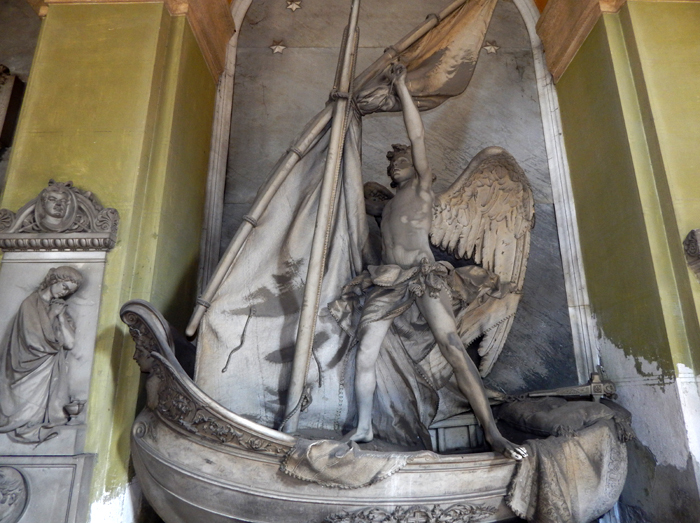 For me, the most impressive sculpture by far is the monument for the family of Giacomo Carpaneto (1811-1878), sculpted in 1886 by Giovanni Scanzi (1840-1915). The Cimitero itself, and the Commune di Genova which is responsible for its operations, obviously agree that the Carpaneto monument is important, as it was on the cover of the Cimitero's offical 2014 brochure. While the Monteverde Angel is the epitome of graceful contemplation, and the Campodonico is one of the finest examples of detailed marble realism anywhere, each of these has basically one message for the viewer, so to speak. Each is an expression of a single concept. The Carpaneto monument, on the other hand, is an entire story, a journey with a conclusion, a mixture of the earthly and spiritual aspects of life that engages the viewer like few other works of art. The sculpture has its own identity beyond the monument it graces. 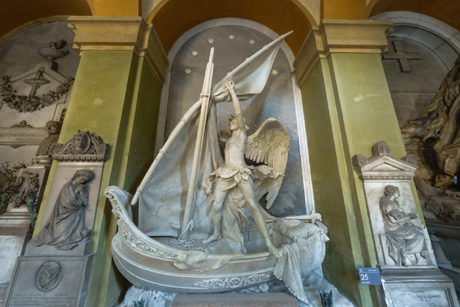 It is known as L'Angelo Nocchiero - The Angel-Helmsman. Art experts and aficionadi sometimes simply call it Il Nocchiero. I became aware of the masterpiece, and indeed Staglieno itself, for the first time in about 2011, when I was browsing around a neighborhood yard sale (far from Italy, I can assure you! ), and found a small book of what you might call tourist photographs published in the 1920s. (Anonymous. Camposanto di Genova - Piazzale del cimitero di Staglieno. 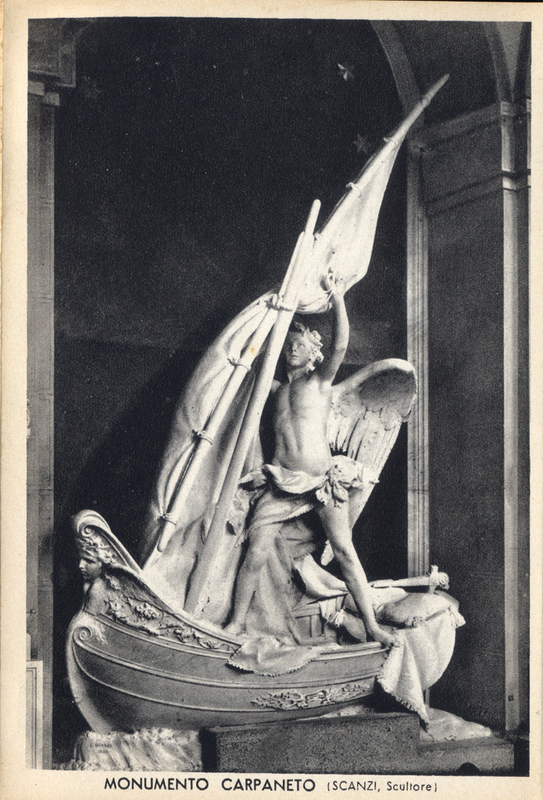 Genova: V. Lichino e Figlio, n.d. [c.1920]) This was the picture of the sculpture in that book, probably taken relatively soon after the work was completed in 1886. As I read the description on the back of the photo, I began to realise the complexity of the work. The inscription at the base makes its story clear: "Blessed is he who on the sea of life had so sure a guide." (The translation is from the above-mentioned book.) The need to visit Genova and see the artwork in person soon became inevitable. My opportunity came in 2014. I was prepared by recent photographs on the Internet to see a stunning work of art in some disrepair (see below), but I trusted that the genius of the piece would somehow compensate. I was not disappointed. The Empress Elisabeth of Austria (1837-1898), the wife of Emperor Franz Josef I and known to her subjects as Sissi, visited Staglieno in March of 1893, as have many famous people over the years. Sissi was so impressed with the Carpaneto monument that she copied the inscription into her personal notebook. The Carpaneto monument is in a covered porticato, a walkway open on one side to the central courtyard of the original Cimitero. It is not subject to rainfall and encroaching vegetation, but has collected more than a century's worth of dust and other sediment which over time can compromise the surface of the marble. This is how the sculpture looked on my first visit, 6 October 2014. These layers of dust and darkness are typical of most of the art works at Staglieno. The environment of industrial Genova hadn't been the only destructive force acting on Carpaneto's legacy. A few visitors, who should have considered themselves fortunate just to view the statue, instead made it a most inappropriate place to make their mark (literally). 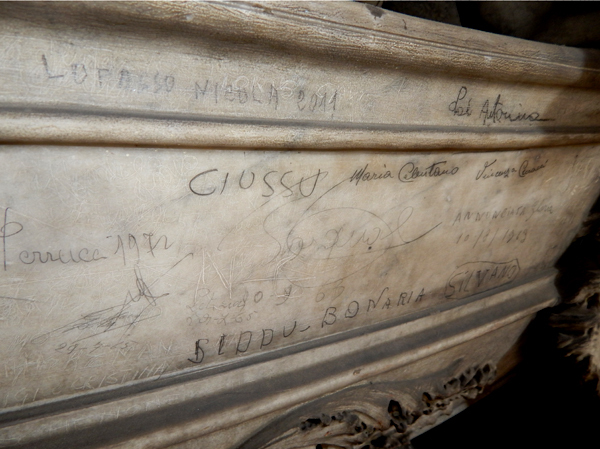 There should be a special place far below Staglieno for those who would deface any monument in this way. Enter the conservation experts, and their anonymous benefactor. 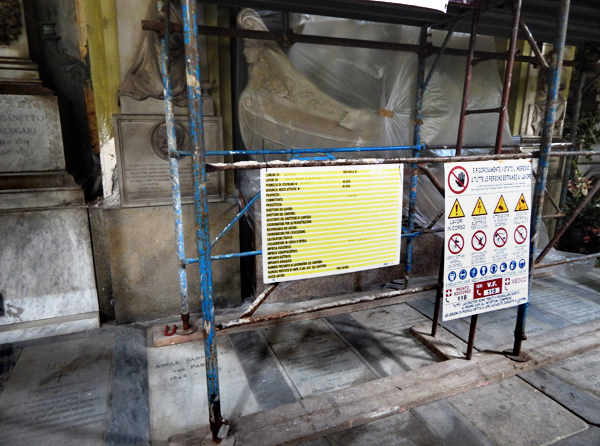 In 2016 an extensive clean-up and restoration of the monument was carried out, led by conservator Livia Pecchioli of Genova, with guidance and advice from art experts Grazia Badino of Firenze, and Emilia Bruzzo, all of whom have made conservation and restoration in Staglieno their special projects. On my second visit, 30 September 2016, this was the encouraging sight, and I learned that by then the restoration had been completed and was awaiting finishing touches and unveiling. The prow of the boat can be seen behind the scaffolding, and I could see that a brilliant transformation had been made. The photographer who made the photos for me was Thomas Krüger (ThomasKrueger.eu). When he sent me the images, he threw in an added, unexpected bonus: an interactive 360° panorama, which, in closing, I share with you here. Ladies and Gentlemen, the restored Carpaneto Monument of Giovanni Scanzi at Staglieno, in its natural setting.